Today in Masonic History Johann Adam Weishaupt passes away in 1830. Johann Adam Weishaupt was a German philosopher and founder of the Order of the Illuminati. Weishaupt was born on February 6th, 1748 in Ingolstadt, Bavaria. At the age of 5 his father passed away. After the passing of his father, his godfather, Johann Adam Freiherr von Ickstatt, tutored him. 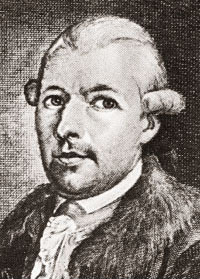 Ickstatt was a proponent of the Enlightenment philosophy and instilled that in young Weishaupt. Ickstatt also was a rationalist, a belief that holds reason is the chief source and test of knowledge, which also was a strong influence on Weishaupt's early education. At the age of seven Weishaupt attended a Jesuit school. He would enroll in the University of Ingolstadt where Ickstatt and Weishaupt's father both taught. In 1768, Weishaupt graduated with a doctorate of law. In 1772 he became a professor at that same school. In 1773, Pope Clement XIV suppressed the Jesuits (also known as the Society of Jesus). This gave Weishaupt the opportunity to become a professor in canon law. The position had exclusively been held by a Jesuit up until that point. On May 1st, 1776, Weishaupt founded the Order of the Illuminati in Bavaria. He adopted the name "Brother Spartacus" within the order. There is no clear evidence of what the purpose of the order was when it was founded. One claim is that it sought to promote the doctrines of equality and freedom throughout society, this was in direct opposition to the inner workings of the order which was not egalitarian or democratic in nature with it's inner workings. Others say that it's goal was replace religion with rationalism. The actual workings of the order involved spies and counter-spies. Each isolated cell of initiates answered to a supervisor, that none of the initiates knew. Weishaupt also set specific books and materials that all members had to read. Although Weishaupt's goal was "enlightenment" for it's members and society as a whole, by it's own rules and regulations it prevented free thought by it's members. In 1784, just eight years after the order was formed, writings from the order were intercepted in Bavaria and the group was declared seditious and the order was banned. Weishaupt lost his position at the university and fled Bavaria. Once Weishaupt left Bavaria the order collapsed and the Order of the Illuminati came to an end. He wrote four books on the Illuminati over a three year period while in exile. They were A Complete History of the Persecutions of the Illuminati in Bavaria (1785), A Picture of Illuminism (1786), An Apology for the Illuminati (1786), and An Improved System of Illuminism (1787). Weishaupt's character and intentions has been seen in a wide and varying light. The opinions on him range from a 'human devil' to a misunderstood social reformer. At least one author who falls into the latter camp states "It is one of the deplorable and tragic ironies of history that a man who tried to inculcate virtue, philanthropy, social justice and morality has become one of the great hate-figures of 21st-century ‘conspiracy’ thinking." Weishaupt has appeared in a variety of pop culture references. His name is used in the video game Deus Ex, in the game a virus is discovered with a molecular structure in multiples of 17 and 23 which a character comments that 1723 is the year Weishaupt was born when it was actually 1748. He is also mentioned in the Illuminatus! trilogy, a satirical series of books (although generally now printed as one book) which go after modern day conspiracy theories. In the book it is claimed that Weishaupt killed George Washington and took his place as the first President of the United States. In this purely fictitious account, the book claims that it is actually Weishaupt on the dollar bill not Washington. Weishaupt died in Gotha, Germany on November 18th, 1830. Weishaupt joined the masonic lodge "Theodor zum guten Rath" in Munich in 1777. The ideas that he brought with him from the founding of the Illuminati were not welcome reforms in the fraternity. He did create a quasi-masonic society and recruited members from inside the fraternity. Weishaupt claimed that his system was "pure" masonry.